We came to Hemel Hempstead in 1964 after I had accepted a job in the laboratory at St Paul’s Hospital. The advertisement had offered housing. At this time we were living in the top half of an Edwardian House in Kensal Rise, sharing a bathroom. Getting accommodation in Hemel Hempstead proved more difficult. Tenancies were not normally given to married women. My husband didn’t qualify as he was still working in London. Eventually we were offered a flat in Gadebridge – ground floor, self-contained with a communal drying yard – a strip of garden. Our immediate neighbours were very friendly and one would cat-mind when we went away. There were several options for my journey to work. At 8am getting a bus in Gadebridge Road that would travel up Queensway to the Industrial Estate. All the later buses went through the town centre so I would have to walk from the Parade. I could leave home at the same time and walk across the park, my preferred route in summer. Most household shopping was done in the town centre at weekends. The High Street shops closed at lunchtime on Wednesday afternoons. Work was scheduled to finish at 5.15 but rarely did, so shopping then was not an option. The Wavy line shop on the parade did stay open longer and could deliver. I did use the Rossgate shops when I was not working. There was a supermarket as well as the usual neighbourhood shops. As we hadn’t a washing machine, the launderette was well used. There was an electrical shop where we rented our first TV – it’s now a bed shop. The town centre shops I remember the best were Sainsburys, Woolworths, with the cheese and cold meat counter, also Fior Fabrics and Shalets as they both sold dress fabrics. I could buy knitting wool at Dinky Dells in the High Street and the Wool Shop on the Parade. Our dining table came from Times Furnishing, where W.H. Smiths is now. A sofa came from Perrings – I think that was somewhere along Marlowes where Nationwide and Woolwich are now. The Bradford and Bingley site was a ladies outfitter called Vanity Fair. There was a shoe repairer in Alexandra Road. This moved one side of the road to make way for an office building, at one time a doctors surgery. Work at the laboratory covered both hospitals and as there was an A&E this could involve us at the laboratory at any hour of the day or night. At first I had no phone at the flat so the local taxi firm Blackies Cars would turn up at the flat wake me up, wait while I got ready and take me to work. Once I had finished I’d ring him to get me home. When I finally got a phone it wasn’t a party line, which was the norm in 1965. One snowy weekend the taxis couldn’t get up Galley Hill or Warners End Road to fetch me into work. Luckily my husband came home and was able to make it up to the hospital. There were 10 technicians in the laboratory. Several clerks and cleaners. The laboratory was at the top of the site overlooking the tennis court, which we could use. The building had not been designed as a laboratory. It was small and flat roofed, very hot in the summer and cold in winter. Sometime later it was extended into the ancillary staff accommodation. The administration offices were housed in the original one storey building overlooking Allandale and the front car park. On one occasion a car backing into a space went too far and hung with the back wheels over the wall. There was a long drop down to the road. To get to know people in Hemel Hempstead we joined the Warners End Players. We rehearsed at J.F.K. then Warners End School. Productions were at Bourne Valley School, now a housing estate. The group finally folded when production costs were greater than income. It had been great fun while it lasted. Making costumes scenery and props. We even took one production to a Drama Festival at Felixstowe. Evening classes were run at most Secondary Schools. For me it was dressmaking at Halsey School – now more housing. After a badminton course at the college we formed a small club and played at Maylands School. There were two Green Line Services in Hemel Hempstead. The 708 through Kings Langley Watford and Edgware. I used this to get to my parents in Cricklewood. The 719 used a different route going through Kingsbury and Neasden near my in-laws. The Garland Close estate was built in 1968 originally for NTC and council tenants. 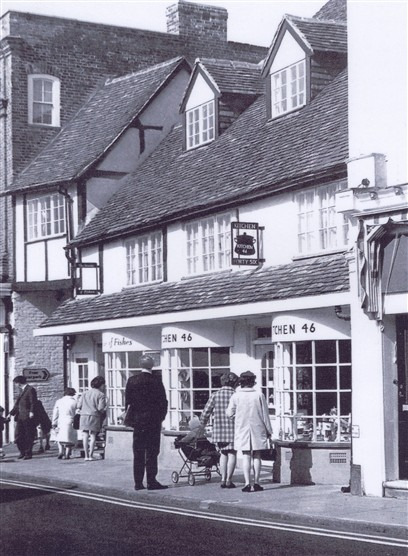 We managed to persuade a building society to offer us a mortgage and moved in July 68. It has always been a friendly place to live. Although many of the houses have changed hands there are still some of the original owners here and we meet up for meals out occasionally to catch up on news.